In all the conferences I have attended, schools I have visited, or hangouts I have joined, I have never met a user of Google Apps for Education that did not have something awesome to share. Anyone who uses Google Apps inevitably finds ways that it improves teaching and learning in their class, school, or life. Thanks for your interest in posting to the Apps User Group website! Google Apps for Education has such a strong community, and it is always great to learn ideas, skills, and tips from teachers, administrators, tech coordinators, and others who use and benefit from Google Apps. See below for guidelines on how you can share with this wonderful community. Posts need to be related or relevant to Google Apps for Education. This could include news, tips, tutorials, reviews, resources, examples of neat uses, and more. Posts from vendors are ok as long as the product is related to Google Apps for Education, provides a real value to educators, and I am comfortable with the content. Include some biographic information about yourself that I can tack on the post, such as name, job, location, contact info, social media links, photo, and such. Of course, only share what you wish. 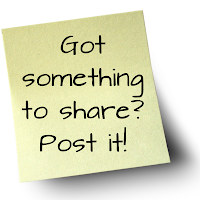 Feel free to share your post on your own site or other sites as well. If you have any questions let me know. Thanks so much for being willing to share your knowledge, experiences, and skills with others. That’s what makes this community so great!